Today, Star Wars: The Old Republic turns five years old, despite of many nay-sayers pronouncing it doomed and dying almost from day one. Looking at it now, I would expect it to easily last another five years at least, even though people are proclaiming that it won't last another year even now, and someone is going to release Star Wars Galaxies 2 any moment now to replace it as "the Star Wars MMO" (heh). I don't want to use this post to look back on the entirety of those five years though, because I already covered four of them previously! Shintar the trooper over the course of five years. Year 5 has once again been an "interesting" one, largely because Bioware doesn't seem to be able or willing to settle into any sort of rhythm. We've had a total of six "expansions" by now (you can argue about the label but the specifics aren't really relevant for this discussion), and I still don't have a clue when to expect the next one and what it will entail, because they are constantly trying to change things up. In some ways this is good, because it keeps things fresh and I do enjoy being positively surprised, but at other times it feels like Bioware still isn't entirely sure what they want this game to be. After five years, I think it's about time that they make up their minds. 2015 was supposed to be the year of big change, with their massive revamp of nearly all existing content and a focus on single-player story in the Knights of the Fallen Empire expansion, but 2016 followed up on this a bit awkwardly. We did get KotFE chapters 10-16 as well as nine chapters of Knights of the Eternal Throne, which were pretty great and did provide more "quest content" than we've had in any previous expansion. (While the chapter format is very different from classic MMO questing, I still think it's fair to call it quest content, because at its core that's what it is.) But everything else...? Eh. We did get a new warzone for the first time in ages, and it quickly became my new favourite, so that's a win. There was also a new arena and the new uprising format for small group content, which launched with five different scenarios. The new Dark vs Light battle system introduced in KotET gave us some new world bosses, and the Alliance system provided us with a bunch of new companions. We also had a "world event" in form of the one-off Dark vs Light event, but that didn't really add anything new to the game, it was more like those double XP events that encourage you to level alts. Still, looking at that list there was actually more additional content there than I thought. Nonetheless, people have been feeling the lack of new operations, flashpoints or explorable planets for the second year in a row very keenly. Also, the time spent on systems changes this year did not feel like time well spent. The split into PvE and PvP instances instead of having dedicated servers for each didn't generate much interest. The "New Pack Opening Experience" was widely derided as a waste of resources and from what I've heard even people who like to open packs tend to find it a bit annoying. And then of course there has been the blunder of Galactic Command, which has been decidedly ill-received by the paying community as well as serving as bad PR for the game in wider MMO circles. You need to look no further than Massively OP, which voted for SWTOR as the MMO with the "Worst Business Model" this year, after it was in the running for "Most Improved MMO" last year. I personally don't think that award was deserved, but it shows just how much bad publicity the game has managed to generate this year compared to last, which is a particular shame after it seemed to manage to garner so much goodwill from the public in 2015. So in summary: I wouldn't say that it has been a bad year for SWTOR, because they did release a good chunk of content, but a lot of fans that were disappointed by the areas in which KotFE has been lacking have had reason to grow even more jaded. Last year the revamp of nearly all levelling and group content seemed to offer a good excuse for the lack of non-story additions, but this year it has been harder to justify. Once again I can only hope that Bioware will find a better balance going forward. According to a rarely-seen guildie who claims to have talked to a Bioware employee in Ireland, those new operations are coming. Great writeup! I'm feeling so nostalgic this time around. I don't know why, perhaps it's just that 5 years finally feels long enough for an MMO to start getting 'old' and I still love it to its core (as opposed to LOTRO, which became all about the Store around that time). Also, I love the evolution of Shintar the Commando over the course of 5 years. I might steal that idea! Where did you get this white armor with Republic logo? Do you mean the one in the bottom right of the image? That would be a Cynosure chest dyed white and red. Used to be a PvP set for knights that's no longer available. I'm not sure if you can still get anything with the same look right now. Thoughts on Star Wars: The Old Republic from a fan who mostly likes to quest and group up with friendly people, whether it's for operations, flashpoints or warzones. If you want to know more about me, click here to read about the person behind the blog, or here to see what characters I play. I've been blogging about the game without any major breaks since 2011, which probably makes this the oldest, most consistently updated personal fan blog about the game on the net! Thinking about trying SWTOR for the first time or coming back after some time away? If you use this referral link of mine, you'll get some free goodies! If you end up (re)subscribing, I'll get something too, but if you don't... well, no harm done! * So what's the difference between beating Revan solo vs. in the operation? * Levelling Through Flashpoints Post 4.0 - Would I Recommend It? * So THERE's That Skytrooper Control Device! * Which Healing Class Should I Choose? Which Healing Class Should I Choose? Tags - Find more of the content that interests you! Episode 97: Dantooine. They’re on Dantooine. SWTOR Fan Community to Hit Star Wars Celebration 2019! 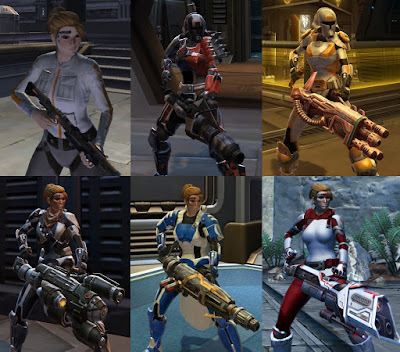 Hawtpants of the Old Republic – Join the hawt side. It is your destiny.